According to new dating tests, these are the first paintings ever made by humans. 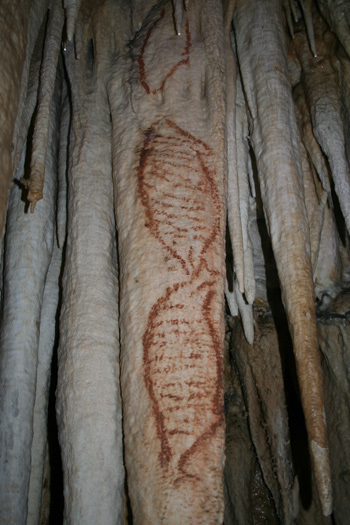 They are seals painted more than 42,000 years ago, located in the Cave of Nerja, in Málaga, Spain. And they may change our ideas about humanity's evolution. Until now, archeologists thought that the oldest art was created during the Aurignacian period, by modern humans. But these are way older, way more primitive than the ones in Chauvet-Pont-d'Arc Cave, the 32,000-year-old paintings featured in Herzog's Cave of Forgotten Dreams. According to the latest dating of the charcoal found next to the paintings—used either to make the paintings or illuminate them—these seals may have been made more than 42,300 years ago. In fact, they may be as old as 43,500 years. Our latest discoveries show that neanderthals decorated their bodies with paint and had an aesthetic sense, and that's a scientific revolutions because, until now, [we] homo sapiens have attributed our selves every achievement, showing [the neanderthals] almost like monkeys. We thought art history was exclusive to evolved humans, that our sensibility was "an intimate part of ourselves, the sapiens, because we think we are the thinkers." This discovery, if confirmed with further testing, proves this sapiens-centric idea wrong. According to Sanchidrían, all the available scientific data shows that these pictures could only have been made by Homo Neanderthalensis instead of Homo Sapiens Sapiens, something completely unthinkable until this finding. "The charcoals were next to the seals, which doesn't have any parallelism in paleolithic art" said the professor, "and we knew that neanderthals ate seals." And there is no proof of homo sapiens in this part of the Iberian Peninsula. Researchers think that this cave was one of the last points in Europe in which neanderthals—who lived from 120,000 to 35,000 years ago—sought refuge, escaping the push of the Cro-Magnon, the first earliest homo sapiens to reach Europe.